Mike Kemp, in an interview shown at the opening of Baxter Arena. Photo courtesy university communications/youtube. From making it to the NCAA Frozen Four for the first time in 2015 to having former Mavericks Jake Guentzel and Josh Archibald win the Stanley Cup, the Omaha hockey program has had many achievements throughout its historic 23 years. It has grown from being a club team back in 1975 to a reputable Division I hockey program. It all started with one man: Mike Kemp. Kemp earned a degree in Public Relations Communications from Gustavus Adolphus College in the summer of 1975. He decided to return home to Duluth, Minnesota and work with his father. He then received a call from his old hockey coach–it was the University of Nebraska at Omaha (UNO) looking for a club hockey coach. There were players of every background. One was a 38-year-old from North Dakota working at Kellogg’s. Another, from Michigan State, was in their mid-30’s and worked as a salesman for a major corporation. There were Creighton Prep seniors. Even Kemp’s closest friend who had just returned from Vietnam joined in the fun. Later, the friend would be involved in starting the competitive program in 1996. When Kemp first arrived, there was talk that the University would start a varsity hockey program the following year. Kemp began recruiting immediately, going as far north as Canada. However, the University ended its efforts early, citing the financial strain adding another men’s sport would cause the school. Kemp would leave for another job shortly after that. Nearly 20 years later, with Don Leahy at the helm of the Omaha Athletic department and Del Weber as Chancellor, the two (with the help of community leaders) tried to find a way to make the athletic department financially successful. When the university confirmed that all necessary start-up costs were covered, tickets went on sale May 1, 1996. For $25, fans could “save their seats” for the 1997-98 season that was still 17 months away. There was no coach, there was no roster, and there was no building – but after 16 days the athletic department still successfully sold out the Civic Auditorium. When the university began its search for a head coach, Kemp was the last one to put his application in. Kemp was one of five finalists and was the last to be interviewed. On the morning of his interview, UNO’s faculty representative to the NCAA picked up Kemp from his downtown hotel, and asked if he’d seen the paper. Kemp said he hadn’t. After the interview, Kemp took a flight to Lake Placid as a recruiting trip for Wisconsin. He picked up a paper at the airport before he left. The headline read: Frank Serratore to be named Maverick head coach; Kemp from Wisconsin to interview today. After a nap, Kemp was ready to take to the rink for his recruiting trip when the phone rang. 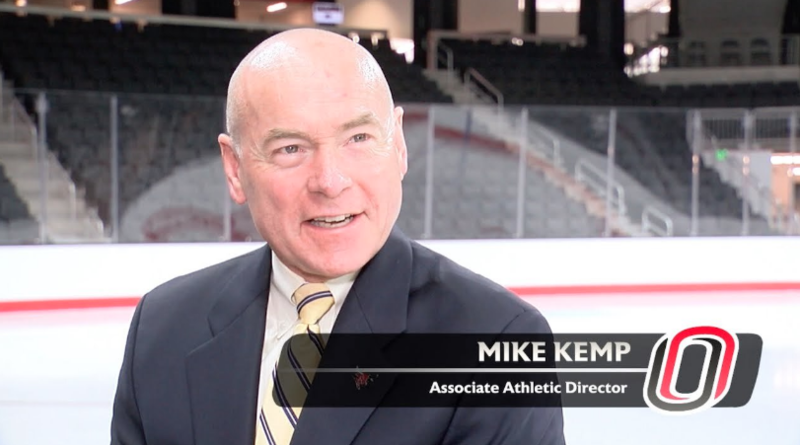 It was then that Mike Kemp was offered the job as UNO’s first head coach for varsity hockey. He never made it to the rink. Instead he had several calls to make: first to his wife, next to the University of Wisconsin, and finally to all the press that came calling. It was only after that he could celebrate his first head coaching job, Kemp said. While at Lake Placid, Kemp began building the first team. There he found his assistant David Quinn, previously at Northeastern. The two started to recruit, order equipment, design uniforms and put together a schedule. Kemp and Quinn ended up recruiting 30 players for the first season and “a well thought out schedule,” according to Kemp. Kemp coached for 11 more years until 2009 when he was bumped up to his current position: Associate Athletic Director. He finished his career with a record of 201-220-53, paving the way for future hockey success. Mike Kemp’s tenure included some memorable moments. The first sweep in school history against Denver, beating 90’s powerhouse Maine on the road, ranking in the top five in the 2001-02 season, a 100th consecutive sellout at the Civic Auditorium, being named CCHA Coach of the Year in 2005 while finishing fourth in the conference, UNO’s first appearance in the NCAA tournament in the 2005-06 season and coaching five All-Americans. When asked what the next step is, Kemp said retirement–but it doesn’t sound likely anytime soon. If he does retire, Kemp plans to be involved with the University and its programs, even if he doesn’t get paid. “They’re going to be stuck with me one way or another,” Kemp said.